Quilt Story: Fabric Tuesday and Oh Baby! Hey everybody! I've got another baby project to share. One of our best selling patterns is Oh Baby! 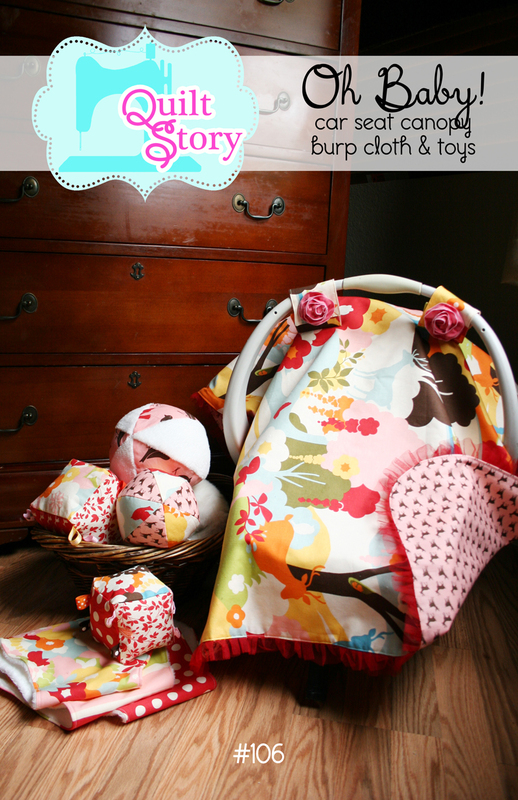 it's appliqued burp cloth, toys and a car seat canopy. Selfishly I remade the cover so I could have one for my baby girl! The fabric line is oh deer! 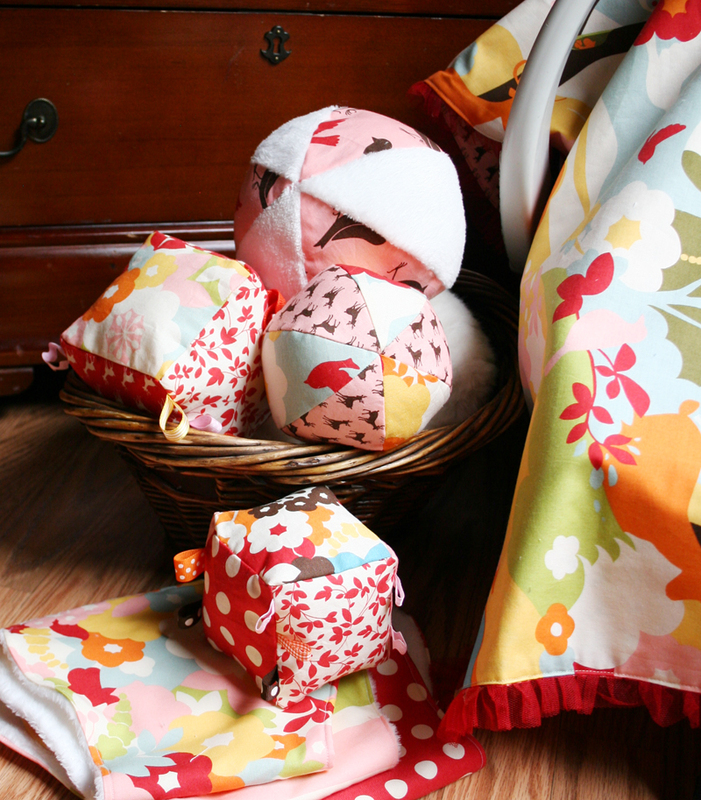 by Momo for Moda Fabrics. I love that pink fabric with the tiny deer! And the main print is really cool, it has all sorts of flowers, trees and creatures. Obviously I chose the girl colorways but the line works for boy and girl. My LQS has fabulous ruffled trims, the tulle one I added in the canopy and the flowers were super simple, already ruffled just some gathering and hot glue. I always always hang onto minky/cuddle/chenille scraps. They work so perfectly in these toys, it's nice to have the extra texture. There you have it! A new cover (and new goodies for my baby!). Pattern can be found in our shop. 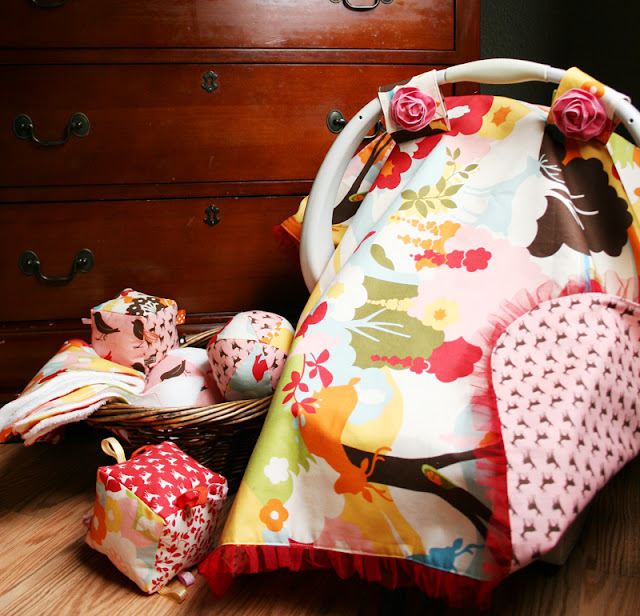 Your collection of baby things looks fabulous in that cute fabric. Oh my! Your new baby girl is going to be the luckiest girly ever. What a nice world to come into and what a lovely mommy to have! Having only boys (which there is a derth of really sweet, cute things for them it always seemed)...your fabric choices make me smile! Love, love, love the ruffles! Ha - we are totally in sync again today with sewing for the little ones! Yours are adorable! I love the trim. Aww. How sweet! I like the fabric you chose. Thanks for hosting! What a fun and fresh baby carrier cover! Great pattern and the fabrics are perfect for it! Thank you for these photos, I really liked them. Come to our service and tell the assistant : write a paper for me. I know what you need is homework help.